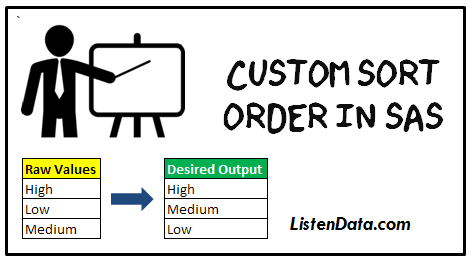 In this tutorial, we will cover how to apply custom sort order in SAS. Most of the times, we want to sort variables manually with a custom sort order instead of alphabetically. For example, we have a variable called 'group'. It contains three unique values such as 'High', 'Low' and 'Medium'. We want values to be sort in such a way that 'High' appears first and then followed by 'Medium' and then 'Low'. The following program would be used to create a sample data. What's wrong with PROC SORT? PROC SORT sorts the character variable alphabetically. PROC SORT would return 'High' in the first observation, followed by 'Low' and then 'Medium'. We want 'Medium' to be appeared in second observation and 'Low' in third observation. The $rank format is created to define custom sort order. The keyword $ is used to tell SAS the values are character. Later, put function is used to apply the manual sort order and ORDER BY is used to sort the variable. The SQL 'CASE WHEN' syntax is an alternative to IF THEN ELSE statement in SAS. 3 Responses to "SAS : Custom Sort Order"
Deepanshu,can you please elaborate how to sort the dataset without using any proc ?